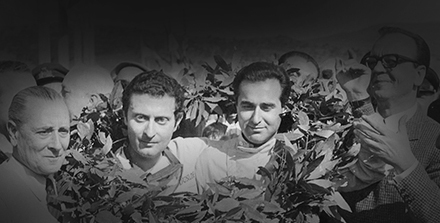 When the Grand Prix Drivers Club was formed fifty four years ago the great Juan Manuel Fangio had been retired for just four years. He competed in his last grand prix at Reims in the 1958 French Grand Prix driving a Maserati 250F and despite losing his clutch still finished fourth. It was exactly ten years after his first ever grand prix at the same circuit in 1948. 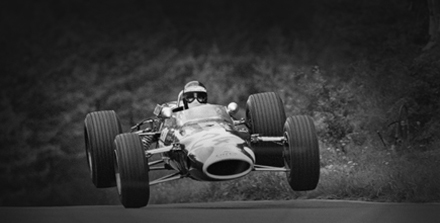 To many people, and particularly to those who saw him race, he was possibly the greatest racing driver ever known but he was something of an enigma. Around the paddock he always appeared to be in the background and yet always had a twinkle in his eye . One was also struck by his high pitched voice which I never heard raised in anger. However, at the wheel of a racing car he was magical. At a time when a grand prix driver can log over 200 grand prix starts it is interesting to compare that number with Fangio’s 51 starts. In those few races he managed to win 24 grands prix and five World Championships. These were different times. Fangio’s family were Italian immigrants to Argentina and he started working in a garage at the age of 11 to help support the family. From the start he wanted to race and started modestly with a Model A Ford he modified himself before moving to a typical Argentinean Ford V8 Special and then a Chrysler special with which he made his name as a tough and determined driver. His major early win came at the age of 29 when he won the 1940 Gran Premio del Norte an enormous marathon road race that took days and covered 5,900 miles. 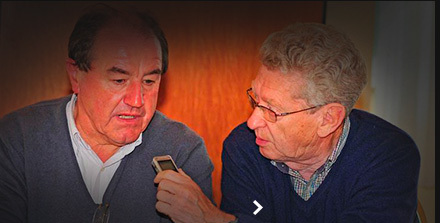 Eight years later some European drivers were invited to race in Argentina led by former Club members Guiseppe Farina and Luigi Villoresi. This led him to be invited to Europe for the 1948 French Grand Prix to drive a factory Gordini. Up against the all-powerful Alfa Romeo grand prix team in a very underpowered car Fangio ended up on the fifth row of the grid but was no less than 13 seconds faster than his team mate Pierre Veyron in the other Gordini. 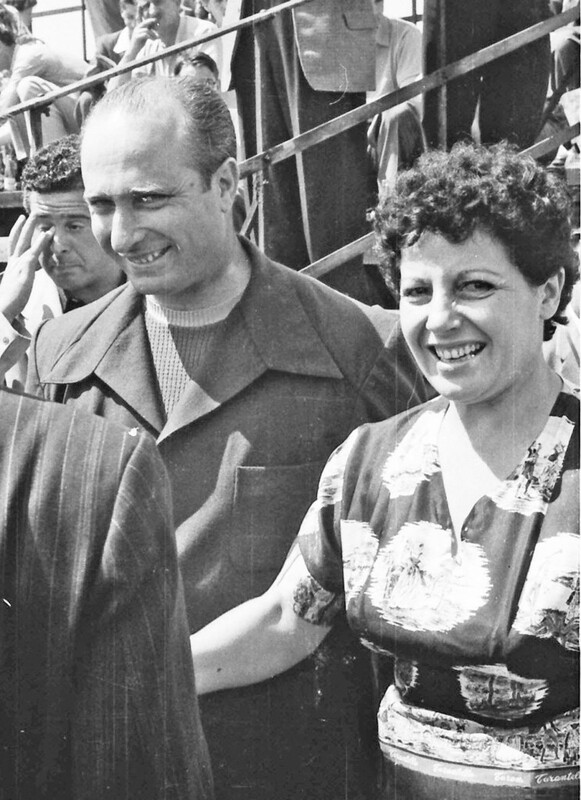 Two weeks later the Automobil Club of Argentina entered him for the Grand Prix of Comminges in a Maserati 4CL but the deal fell through so Fangio returned home after just one race but the Maserati went back home with him. In April 1949 he returned to Europe this time with a brand new 4CLT/48 Maserati the Automobile Club had bought and in his very first race, at the San Remo grand prix he ran away with the heat and romped home winner in the final. 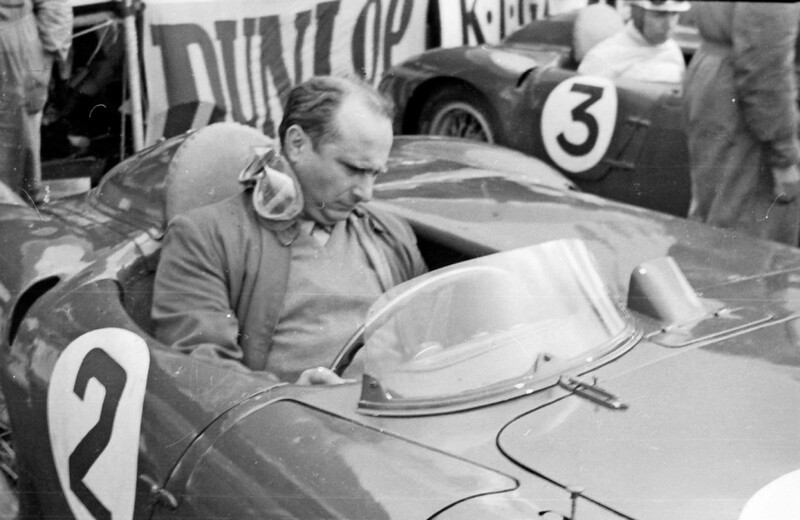 Fangio had arrived and not only that but his win led to that 4CLT Maserati henceforth to be called the “San Remo” model. His great talent had been recognised by Alfa Romeo and he returned in 1950 to drive for them in the first World Championship Formula 1 grand prix at Silverstone but before that they gave him a warm-up at Pau and won first time out in an Alfa. At Monaco that year he won his first World Championship Grand prix and that season finished second in the World Championship to his team-mate Nino Farina. 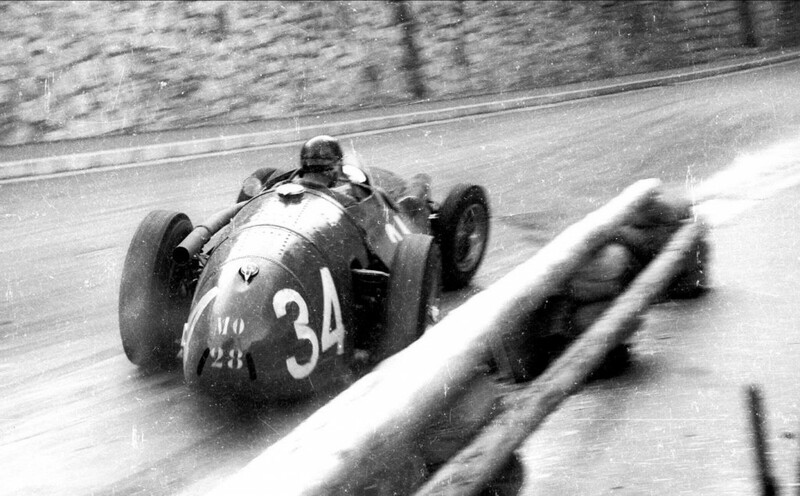 However, Fangio was then to carve out a remarkable record. 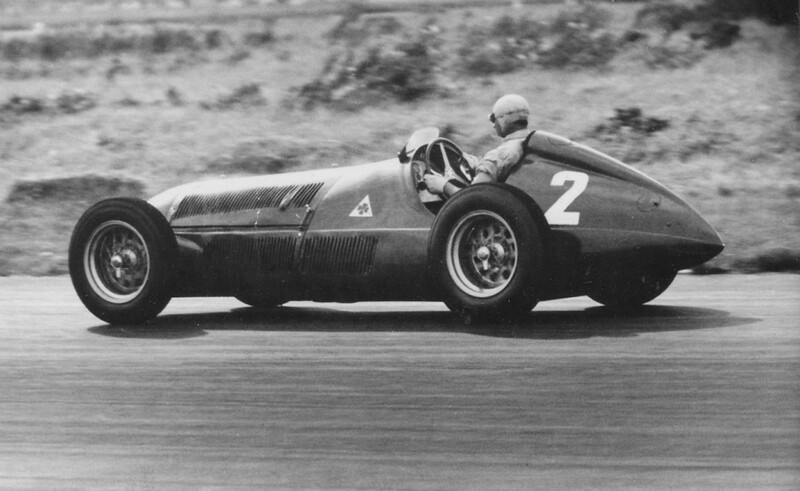 In 1951 he won his first World Championship with Alfa Romeo but in 1952 was left out in the cold as the Championship was run for Formula 2 2 litre cars and Alfa had withdrawn from racing. He did, however race for BRM with the fragile V16-engined car which was not his best season. However for 1953 he joined the factory Maserati team and finished second in the World Championship and from then on he won World Championships for Maserati/Mercedes in 1954, Mercedes in 1955, Scuderia Ferrari in 1956 and again with Maserati in 1957. In 1958 he ran only two World Championship races, the Argentine Grand Prix when he was fourth and finally at the French Grand Prix where he again was fourth and retired. Meanwhile had had raced various other cars including a tiny Cisitalia D46 and in sports cars he took second place in the 1953 Mille Miglia with an Alfa Romeo Disco Volante even though he ended up with only steering on one wheel. He drove in his first Le Mans 24 Hour race in 1950 with an unique Gordini T15C Coupe with a 3 litre supercharged engine but it broke down after 13 hours. A year later he shared a Talbot-Lago with Louis Rosier but again retired. In the tragic 1955 race he and Stirling Moss were running in second place with their 300SLR Mercedes when Pierre Levegh hit the back of Lance Macklin’s Austin Healey causing the worst accident in motor racing history. The Mercedes team withdrew their cars. In sports cars, then, Fangio was less successful but it did not make him less of a driver as some of his races were sublime in his command of the road and the circumstances. The 1957 German Grand Prix at Nurburgring stands out as his greatest single race where he fought back from a pit stop where he was three quarters of a minute behind leaders Hawthorn and Collins in their Ferrari’s but hauled them in and won the race by just three seconds. When the race started the Nurburgring lap record was 9 minutes 41.6 at the end of the race Fangio had reduced this to 9 minutes 17.4, an incredible performance on a circuit that has to be seen to be believed. Later that year Peter Collins admitted that he could not believe it when Fangio passed him as he had seen him in the pits a few laps before. In retirement Fangio concentrated on his Mercedes-Benz dealership, was to become President of Mercedes-Benz Argentina and a great ambassador for the company. So Fangio was a true megastar when he joined our Club and remains today one of the greatest racing drivers who ever lived.